SHEEP genetic testing is booming in Australia as genomic test costs come down and uptake of new sampling technology improves. 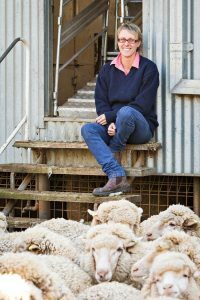 The Sheep CRC said the sheep industry is embracing DNA testing programs at never-seen-before rates, with more than 24,000 genotyping tests and just under 75,000 parentage tests undertaken in 2018. The Sheep CRC said the price of DNA testing has progressively fallen since it was first introduced to the industry on a commercial basis in 2013 when Sheep Genomic tests were retailing for $50 (plus GST). At the start of 2018, the same test was retailing for $35, but in July it fell to $27 (plus GST) for samples collected using a TSU and $30 (plus GST) when collected on a blood card. Sheep CRC chief executive officer James Rowe said this marked a major turning point in the economics and practicality of DNA testing. “Sales since then have rapidly increased as sheep breeders have recognised the returns on investment available to them from the information obtained from genomic testing,” he said. Neogen Australasia general manager Russell Lyons with a sheep DNA sample taken with a tissue sampling unit. 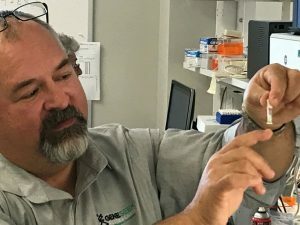 Prof. Rowe said more than 17,000 of the 15K sheep genomic tests were sold in the second half of last year after the price reduction, with more than 95 percent of those samples collected using TSUs. “This shows a clear preference for the new and easier sampling system over the older and more expensive blood card method. “TSUs contain the DNA sample in a form that is much easier to analyse and it also provides improved efficiencies in sample handling,” Prof. Rowe said. Prof. Rowe said the lower price of the 15k genomic tests made them more appealing to breeders who had only used the parentage test in the past. The 15k test provides significantly more genomic information while still providing all of the parentage and horn-poll information, he said. DNA stimulation project manager Sally Martin. The Sheep CRC said the project has 29 ram breeders participating, plus 17 commercial producers breeding their own rams and 60 commercial producers who purchase rams. The MerinoLink/UNE DNA program involves a total of 70,000 DNA tests distributed across parentage, 15K sheep genomic tests and genomic flock profiling, supported by reduced cost of tests through the project. The value of DNA testing to improving sheep breeding programs has been evidenced by the post-project commitment of the group to purchase a further 40,000 tests at full commercial rates during 2019 as participants seek to consolidate on the progress made in 2018, the Sheep CRC said. Stimulation project manager Sally Martin said the project’s aim is to double the rate of genetic gain in the participating group of flocks. “In the past, industry has used genetic selection tools in an ad hoc nature – this project is about developing detailed plans with ram breeders and commercial producers to work out the fundamentals of their breeding objective and how to strategically use DNA testing to achieve that,” she said. Cracking good comment Andrew and spot on. As James Rowe points out the Flock Profile can be used by commercial breeders, rah rah rah! This is a benchmark service, it looks backwards and tells you about where you were 2-3 years ago genetically. I am a repeat user and will continue to make use of the Flock Profile service, but I am also interested in using these genomic tools in testing/comparing individual rams. Why can’t I tighten up my selection processes (in my commercial operation) from my ram team on top of the large amounts of data I am collecting on these animals for several Breeding Objective algorithms used to generate flock breeding values? So far I can’t use these new beaut genomic tools without high costs, years of time delays waiting to get enough phenotypic data on to the Merino breeding databases to get ASBV’s etc and lots of logistical issues in our drought-affected operating environment. As I said, fantastic new free mobile phone but currently only a few people can use it, most people have to drive 10 hours down to a capital city to use it. What David Counsell seems to be alluding to are the high costs in the Merino genetics value chain. How to get the top genetics economically and efficiently out into the mass commercial industry? Such a project is perhaps the only course left for the Merino industry. The lack of a “genomics-only” breeding value is a key impediment to his happening, although such a breeding value is available in the cattle industry. My hope is that “DNA Flock Profiling” will find greater application in marketing commercial breeders genetics. Greater objectivity in this process would inevitably create a demand for low-cost high-index rams, which the boutique stud industry cannot meet unless they adopt mass selection techniques facilitated by genomics-only breeding values. As a participant in the MerinoLink/UNE DNA Stimulation project, it seems nobody is really thinking about how this might work. Such a development would be very disruptive in the sheep stud breeding industry and it seems anybody who thinks about this is keeping their head down. The good news is that we have developed the DNA Flock Profile test specifically for commercial sheep producers. The test provides flock average ASBVs for a number of key traits, without the need for the producer to submit production or phenotypic data on individual animals. This is extremely valuable information for any commercial Merino producer seeking to source rams to meet their breeding objectives. The additional good news is that the price of the Flock Profile test has come down from $800 to $700 (plus GST). 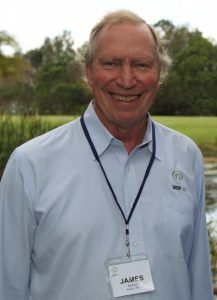 For more information visit our website sheepcrc.org.au then click on SheepDNA followed by Flock Profiling. Is it not an interesting fact that AWI is not a funder of the Sheep CRC or MerinoLink, with its 29 Merino ram breeders? The AWI board and CEO have no interest in animal genetics and no interest in productivity gains. All this as wool production is forecast to decline another 20 percent. A child could market a product that has declined by 50pc in production over the past decade. These cheaper tests are still not available to commercial sheep producers. To use most of the individual animal tests, you need to submit production or phenotypic data on said animals to MerinoSelect. It kind of works like those deals where you get a free mobile phone…but the contract costs you a fortune. These genetic tests will be terrific when more people from the commercial side of the industry can use them.